Donna Carlton provides a carefully-researched description of the "belly dancing" craze that erupted in the U.S. in the wake of the 1893 Columbia Exposition in Chicago. Using primary sources, she describes the truth underlying the tales that have arisen around these dancers. The many illustrations and Carlton's lively writing bring this history to life in a way that is entertaining to read. 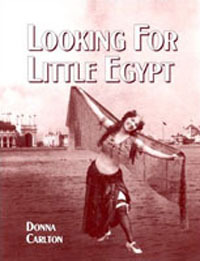 Donna Carlton set forth to research the facts behind the story of Little Egypt, who allegedly was the first famous Oriental dance artist ("belly dancer") in the New World. Popular belief suggests that she was the star of the World's Columbian Exposition held in Chicago in 1893 to celebrate the 400th anniversary of Christopher Columbus' arrival. In this book, Carlton reveals the results of her research. Using primary sources (actual historical documents), she brings to life a pivotal era in U.S. history that has defined public beliefs about "belly dancing" even today. The book opens with an overview of Chicago's Columbia Exposition (world's fair) - the preparations for it, and the event as it launched in 1893. This chapter also introduces Sol Bloom, the impresario responsible for bringing the North African dancers to Chicago to perform at this event. It's a fascinating chapter, showing how ground-breaking this event was in many ways, and Carlton writes it in a way that makes me wish I had a time machine to take me back to experience it for myself. It goes on to explore the Orientalism movement of the time, and its influence on the entertainment offered by the Midway Plaisance of the Columbian Exposition. This provides a context for understanding the nature of the entertainment, and the American public's response to them. The detail on the performers is fascinating to read, and richly illustrated. After describing the entertainers in detail, the book proceeds to explore the public's response to the Ghawazee, the Algerian scarf dancers, and others. It describes how certain individuals found it financially advantageous to cultivate an air of scandal, and how they succeeded in manipulating public opinion in exactly that way. Carlton describes her quest to determine which dancer, exactly, inspired the legend we know today as "Little Egypt". From there, the book explores how this scandal continued to grow and distort public perceptions of Middle Eastern dance long after the Columbia Exposition closed its doors. The book reveals further scandals that tainted the reputation of this dance form, the multiple dancers who all called themselves "Little Egypt" to cash in on the name, and the distortions created by Vaudeville's reinterpretation of it under the name "hoochy koochy". Finally, the book looks at the connection between modern-day dancers and those of the early 20th century. You appreciate historical research that takes care to differentiate between fact and fiction. You appreciate writers who are able to stay close to historical fact while at the same time writing in a way that is enjoyable to read. You're curious about the truth underlying the many stories that are told of "belly dancing" and the "hoochy koochy" in the early 20th-century U.S.
You're seeking vintage photos that show what actual dancers from the Middle East and North Africa wore for their performances in the late 19th century. You have no interest in the history of belly dancing in the U.S. The first thing that struck me about this book was that Carlton committed to following legitimate research methodology. She sought and used "primary sources" such as newspaper articles written at the time of the events, souvenir books of the fair, and Sol Bloom's autobiography. Carllton worked hard to find original documents written at the time the events were occurring, rather than relying on analysis by later people. Carlton's writing style is pleasant to read. Most researchers are terrible writers. Even if the subject of the research is interesting, it can be painfully boring to wade through the academic jargon that most researchers use. In contrast, Looking For Little Egypt is written in a style that I could relax and enjoy. Carlton uses everyday vocabulary and sentence structure. The book contains many illustrations, including many photographs of the dancers, which greatly enhances the experience of reading it. The illustrations support the information being presented in the accompanying text. Carlton remains faithful to the facts. Researchers usually begin their projects with a theory that they are attempting to prove. As facts emerge that contradict their theory, some researchers opt to ignore these contradictions rather than accept the fact that their initial theories contained errors. To her credit, Carlton acknowledges in the book that she had wanted to show a continuous path of Oriental dance in the U.S. starting with the Columbia Exposition dancers and leading up to the present, but the facts she was able to find did not substantiate this. I appreciate her willingness to adjust her beliefs about the history of the dance based on the facts she discovered in her research. Carlton reports what she actually found, not what she had wished she might find. Not everybody would have. The book includes a complete bibliography. For those of us who may be interested in learning more about the subject, this provides a very helpful list of suggestions for additional things to read. The book contains an index, which makes it easy to go back to the book later and find the passages I want to reread. I wish Carlton had included just a little more information about Oscar Wilde's play about Salomé and Richard Strauss's opera, particularly the role these works played in fueling the American public's believe that the "dance of the seven veils" has something to do with Near Eastern dance. Carlton doesn't exactly talk about the origin of the term "belly dance". She frequently refers to le danse du ventre which is the French-language equivalent of the term "belly dance", but doesn't mention Sol Bloom's claim that he invented this term. For a work centered around Bloom's role in shaping American perceptions of Near Eastern dance, this seems like a surprising omission. This is one of my favorite books about belly dance history. When people ask me to recommend the best, most accurate books on this topic, Looking for Little Egypt is always one of the books I mention. I very much appreciate Carlton's use of primary sources in her research, her very readable style of writing, her extensive use of illustrations, and her ability to bring her topic to life. At the time I wrote this review, I had not yet met Carlton. Years later, I did have the opportunity to meet her in person, and really enjoyed getting to know her. I purchased the copy of this book used for this review.